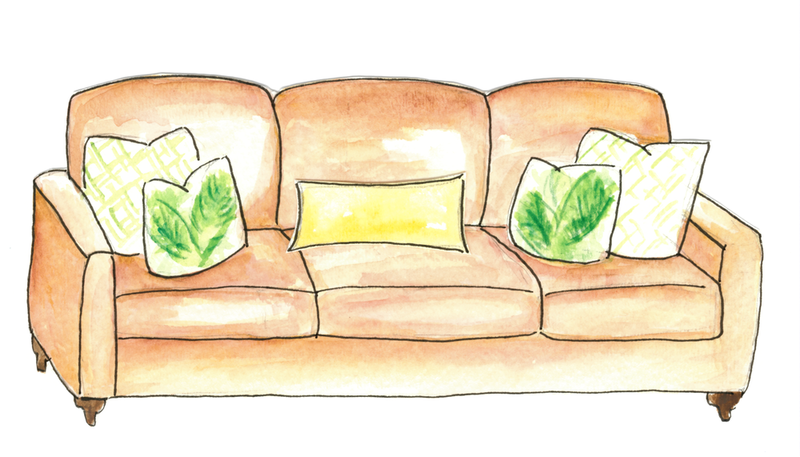 You may not realize this, but your sofa is not a cartoon character. It can wear something else! We all have a favorite cartoon and most of the characters wear their clothes like uniforms. How else would you recognize them, right? No, seriously, the artists drawing them have a lot of detail to draw frame by frame, so I get it! But hey! Your room doesn't have to be redrawn. You don't have to wait till the toss pillows you have are worn out. You can change out your pillows seasonally and make them last longer. My theory is that when we change the room (even a little bit) with the seasons, it helps us to prepare for the different seasons and enjoy them more fully. 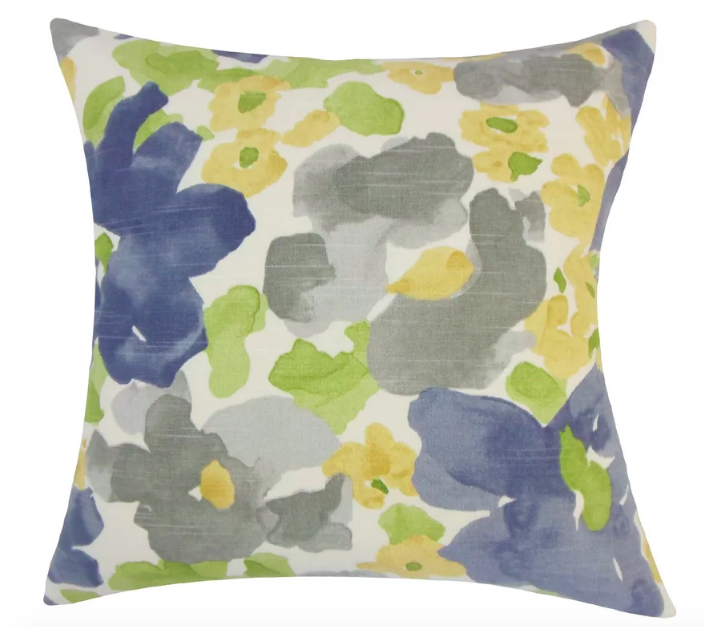 While there are other easy ways to change the room for the seasons, Toss Pillows add a lot of personality. If you are not sure the best way to go about it or how many to have, read on my friend. First take away the plain pillows that came with your sofa. WHAT? Why would you throw out perfectly good pillows? You don't have to. You can always buy covers and reuse those fills OR you can move the pillow to a bedroom. The goal is to not have the "Room in a Bag" look. Next, let's size it up. You could get pillows all the same size or to get a more layered look to have the back pillows be a little bigger. For an average sofa, 20" pillow for the back and 18" pillow for the front is enough to mix it up. Finally, while symmetry and balance are pleasing to the eye, accessories are more interesting in odd numbers. If Five pillows are too much for you, try three. Since the first day of Summer was a couple days ago, I thought I would show you 4 ways that you can change your sofa for Summer. Wanna know where the pillows are from? I've got you covered! Just click on any pillow to see. Palm prints are all the rage this Summer in clothing and in products for your home. The best place to try out a trend is on a pillow. I have seen this palm print on wallpaper and it is stunning. But if committing to a whole room wrapped in it scares you, a smaller dose may be all you need. The bamboo geometric picks up some of the tropical vibes while introducing a different pattern. I paired it with a sunny yellow lumbar pillow for a Saturated punch. Nothing says Summer like an Ocean Sunset. The Orange summer sky gracing the ocean horizon. Who doesn't love the beach at Sunset?! Orange and blue compliment each other since they are opposite on the color wheel. They place nice together and it shows. For this combo, I chose an Ombre Orange pillow for the background and a textured blue that reminds me of rippled water. It even has beaded pearls. The lumbar pillow introduces a pattern and reminds me of a sea fan. Wheather you have a garden or not, everyone enjoys the foliage and flowers that Summer brings. This palette combo has a Summer floral pillow for the background and a sunny yellow geometric that reminds me of sun rays coming down. The blue lumbar is to celebrate blue skies of this season. Who doesn't love cooling off with your favorite ice cream treat. Raspberry Sorbet is a cool mix of creamy pinks and grays with a punch of deep raspberry. The patterned pillow is very playful and a swirly showstopper! The gray reminds me of a cone in that it holds and supports the patterned pillow. And finally, the Raspberry lumbar pillow pulls from the pattern to draw your eye in. Here is to a Summer filled with Sunshine, flowers, ocean sunsets, and finally your favorite yummy treats. I hope these ideas help you to add more Summer to your home. Want more ideas to come to your inbox? Never miss a post and get insider tips from me! Sign up here and get my FREE decorating Guide.